One of the hottest couples on the planet is gearing up for a new original movie called Downsized and I got a sneak peak to speak with them and visit the set. 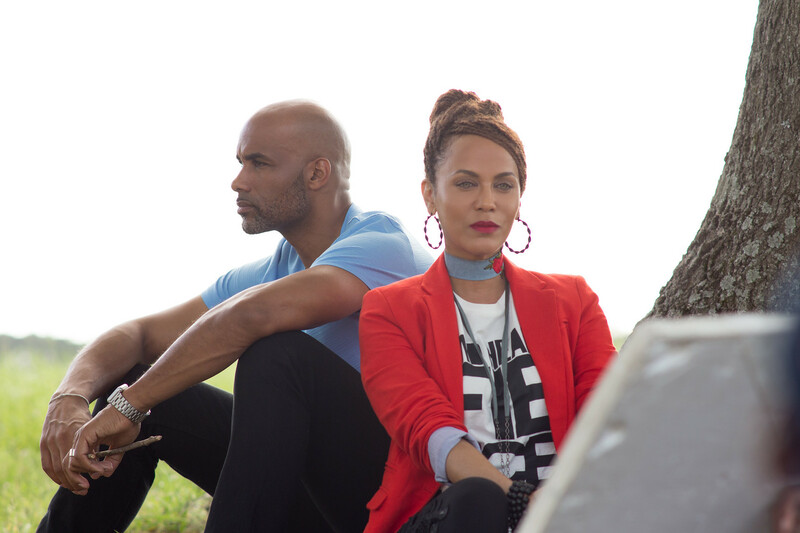 Boris Kojoe and Nicole Ari Parker are a real power couple starring in the upcoming TV One original film in Atlanta and I am excited to share with you all the synopsis of the movie. 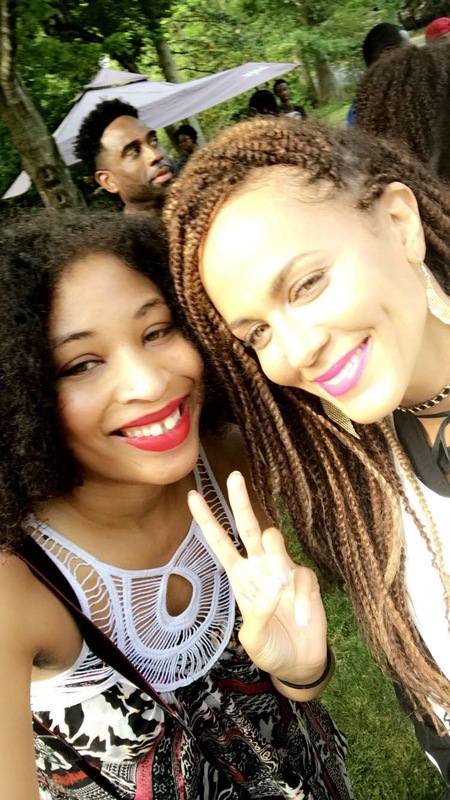 The met originally on the 90s show Soul Food and been together for 15 years and counting co-starring together. 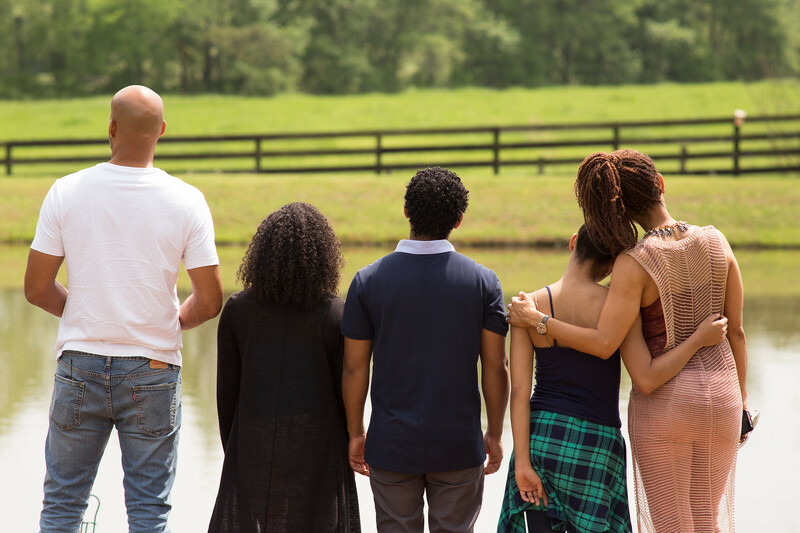 MOVIE DECRIPTION:After overcoming the odds of being teenaged parents who were forced to marry, Ebony and Michael find themselves struggling to keep their family together after years of professional success take their personal toll. As a result, Michael desperately tries to hold onto everything he’s worked his entire life to gain. This leads the family on an unconventional adventure to restore the faith, hope, and trust that initially brought them together. They are still filming the movie here in Atlanta. 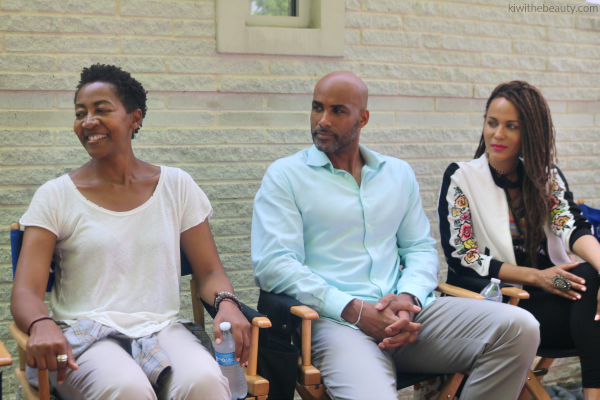 I was grateful to be invited on-set for an intimate press junket with the cast. Oh course I was slightly distracted looking at the fine Boris Kojoe. Nicole is a lucky lady. He is so humble and you can tell he loves his wife! He had a great quote, “We are a couple that works in Hollywood but we arent a Hollywood couple”. The reason why their relationship have lasted so long because they make each other a priority and do not let their Hollywood jobs effect their family. Since they met and fell in love on set, they said working together is actually easy because its something that is fluid for them. It awesome to see this real life couple manifest themselves into a movie couple with a family as it will translate perfectly on the screen. Even through the press junket they were giving each other the googly eyes and cracking jokes with each other. I love to see a real loving celebrity couple. Can’t wait to check out this movie when it debuts this summer. This movie has a really interesting concept and it’s cool that the stars are a couple in real life. Going on set must have been great! I think it’s so cool that they’re a real couple! I’m sure that adds a HUGE amount of authenticity to their performances. What a fun event! This sounds like it’s going to be a great movie. I love that they’re a couple in real life. Very cool! So cool that you had the opportunity to do this interview! What a beautiful group of people!!! The on-set chemistry must be awesome! Such a great looking cast of pure talent! Can’t wait to see it! Downsized sounds like a neat series to check out. I will have to see about following it and I Love when a show has a hashtag, I use them often when checking out a fave show! This sounds like a really interesting premise. I will have to check out Downsized. Downsized sounds like it’s a very relateable show. 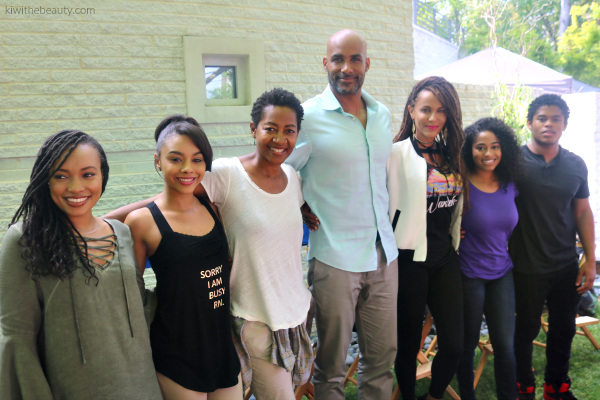 Such a beautiful cast, I can’t wait to check it out! How freaking cool!!! I am so jealous you got to meet the cast!!! AHHHHH!!! Goals!!!! This movie sounds like a great movie that many people will be able to relate to in their own life. I love that the two co stars are actually a couple. Thanks for sharing this awesome sneak preview. What a great interview this must have been. I haven’t heard about this movie yet but now I can’t wait to see it. I was kind of wondering. There used to be a reality show called Downsized that I used to watch. I don’t know what happened to it, and I wonder if this is a take on that show, or something completely different? Oh my goodness how cool to have got to meet the cast and get to see behind the scenes, I’ll have to keep an eye out of the movie now. This show looks great. I love that you are always ahead of the news and sharing things first! You got me so excited for this show! That sounds like a fun time. MY mom has such a crush on that one guy, Boris. She would love to meet him. That is so cool you got to meet the cast! Cannot wait to check out this show! How fun to meet the cast. This sounds like it will be a good one will have to check it out! I love movies that lift your spirit. This sounds like something I would really like to watch. What a great cast. Thanks for letting me know about it. This would be something I’d love to watch. I’ll have to watch for it or rewatch it at some point. I have a list of shows to watch so I’ll add this one. I love the idea of teen parents who make it work. Marriage is not always easy but it is inspiring to hear of other marriage journeys . I find it fun that the couple is a real life couple too! What an amazing opportunity you had to get to meet the cast! I am going to have to keep my eyes peeled for this movie. This looks like it is going to be an amazing show. I can’t wait for it to come on. This sounds amazing! I’m not too familiar with the actors but it’s right up my alley. I’m excited about this one! I’m jealous you got to hang out with them! Any show that revolves around the story about family is bound to be a favorite of mine. I will wait for the date when they start showing this. I am so excited! omg this looks like a great show. i’ll have to keep my eyes open to watch it. I haven’t seen this preview on television yet. Glad I caught it here and I’m looking forward to watching it. How cool that you were able to interview them. I can’t wait to check it out too! How fun that you got to meet the cast. You do some of the best gigs! It sounds interesting and great! I can’t wait to watch their show. Oh my goodness, you are really going places with these opportunities, girl! I think I will love this new movie. Any film that tackles family and relationships is always a winner for me. This sounds like a really great movie. A really great plot, i cant wait to see it! It sounds like a lovely movie that’s perfect for the whole family to watch. I’m sure that there will be couples who will be able to relate to this. Sounds like a great film! And you were on set to interview the cast? Lucky you! That is awesome! How exciting! 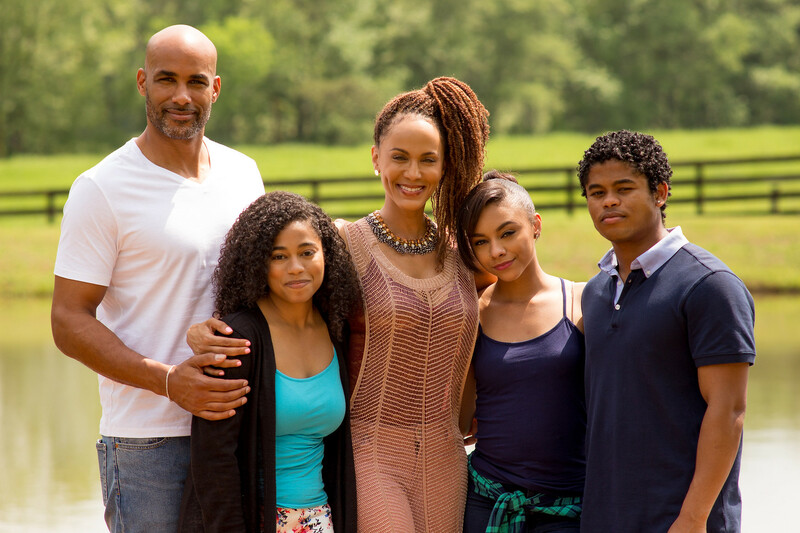 I’ve been a fan of Nicole Ari Parker since the 90s, so I’ll definitely have to check this movie out. How exciting to be invited behind the scenes. The movie definitely seems to have pertinent content and every family needs to watch. How exciting that they are filming more movies in Atlanta. Hot power couple indeed! Lucky Ducks! I have missed a ton of Rosewood, I had no idea that Nicole was on the show, I gotta get caught up! I love the story lines here and how awesome that you were able to be there with the cast and interview them. I want to check it out.! sounds like a good movie with good valuable lessons to learn from… I’ll have to check it out as soon as I get downtime. can’t wait! I love these two as a couple! I’d watch this show if I had cable. I would totally tune in and watch. Being on set must have been so dope for you. Boris and Nicole are so good together.